We are about half-way through March and I am growing tired of hearty cold-weather dishes and craving lighter meals such as fish. This recipe has its roots in Sicilian cooking. 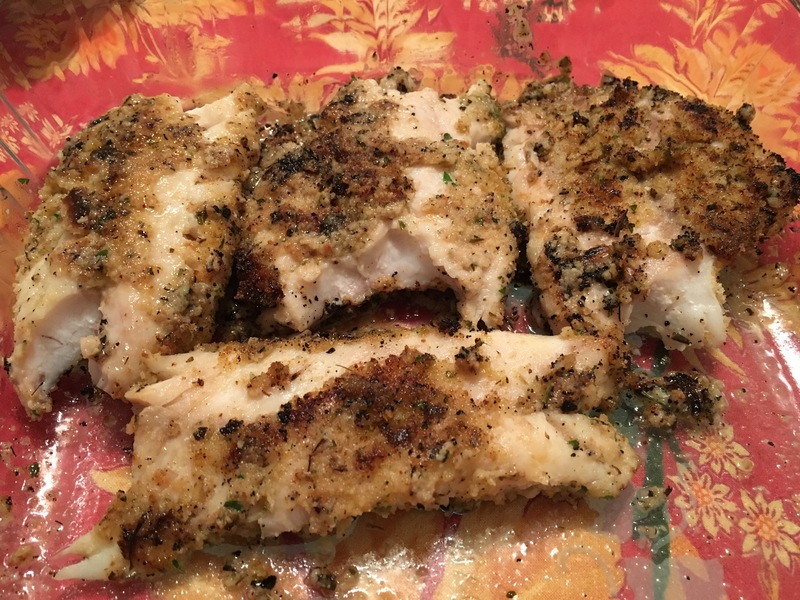 The flavorful, seasoned breadcrumb topping works well with any white fish or other seafood. You can also use it for pork or chicken. Preheat oven to 350 degrees. In an 8×8 square pyrex dish combine 1/4 cup olive oil with wine, lemon juice, and kosher salt. Whisk to dissolve salt. In a separate bowl combine breadcrumbs, cheese, garlic, herbs, salt, and pepper. Mix well. Dip both sides of a fish fillet in the olive oil mixture. Sprinkle the bottom of a 9×13 baking dish with some of the breadcrumbs. Lay the oil-dipped fish fillet in the breadcrumbs and sprinkle more breadcrumbs generously over the top of the fillet. Transfer fish to an oiled half-sheet pan. Repeat with remaining fish fillets, dipping them in the oil mixture then topping with breadcrumbs. Transfer to the half-sheet pan. Drizzle each fillet with a bit of olive oil. Bake for 10-15 minutes, depending on the thickness of the fish, until cooked through. Serves 4-6. This entry was posted in Appetizers, Christmas, Fish and Seafood. Bookmark the permalink.